After studying Cognitive Science at the Radboud University Nijmegen (1991-1996), Prof. dr. Hedderik van Rijn (1972) obtained his PhD (University of Amsterdam, 2002) on a thesis focussing on computational modeling of scientific discovery and cognitive development processes. Between 2002 and 2004, he was a Post-doctoral Research Associate at Carnegie Mellon University, working with John R. Anderson. 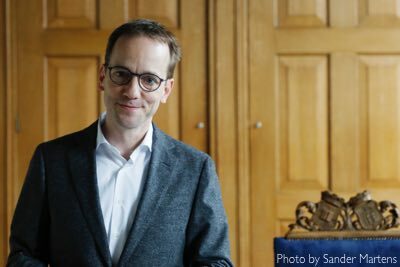 In 2005, he started a tenured assistent professor position at the Department of Artificial Intelligence at the University of Groningen, and since 2009 he is working at the Department of Psychology of the same university, now as "Cognitive Science and Neurosciences" chair. His group studies all aspects of time in cognitive performance with behavioral and neuroscience (EEG, MEG, fMRI) methods. These experiments are informed by and provide support for computational models which provide stringent, formal accounts of theories on interval timing. He is also the principal investigator of the SlimStampen/RuggedLearning system that uses computational cognitive models to personalize the learning of facts. Using this system, learners score about a full grade point higher (~ 10 to 15% improvement) on a test in comparison to more traditional adaptive systems. About 350.000 students in secondary education in the Netherlands now use this system as it has been incorporated in the online educational materials of Noordhoff Publishers (see, for example Grande Lignes, in Dutch). Van Rijn and students supervised by him have obtained numerous grants, both at international and national levels. Most recently, he obtained a prestiguous VICI grant of the NWO (the Dutch Science Foundation). Nine of his PhD students have succesfully defended their thesis, and those continuing in science have been highly succesful in starting their own academic carreers. He is (co-)author of over 75 academic papers and book chapters.